DIRECTV W Connection and defending TT Pro League champions Bankers Insurance Central FC failed to make much ground on 2015/16 Pro League leaders Defence Force yesterday, as the second and third-placed teams finished the “Couva Clásico” in a 1-1 draw at the Ato Boldon Stadium in Couva. 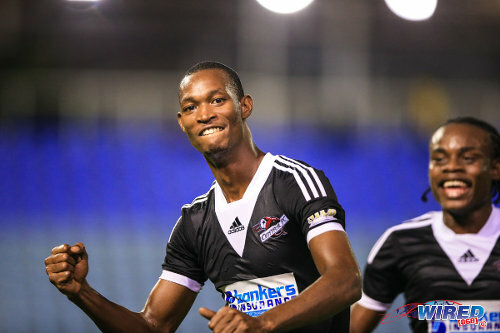 Photo: Central FC playmaker Ataulla Guerra (left) celebrates his goal against Point Fortin Civic with teammate Darren Mitchell in 2014/15 Pro League action. 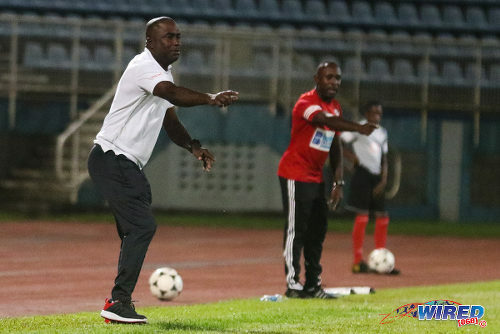 Defence Force coach Marvin Gordon left the same Couva venue fuming on Friday night, as his team conceded a controversial late penalty to surrender a possible victory over Club Sando. But the “Army” coach can rest a bit easier tonight as his team’s closest challengers were unable to capitalise. In truth, the Clásico was no classic, although the 90 minutes still provided a few key talking points. 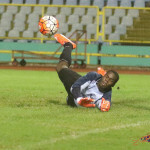 After conceding a 38th minute item by ex-employee Dwight Quintero, Central striker Marcus “Lobo” Joseph won a penalty in the 68th minute after Connection made a meal of what looked to be a straightforward clearance. Referee Callum Marshall swiftly pointed to the penalty spot despite the vociferous protests from Connection’s Gerard Williams. Williams’ angry protest continued, even as Central’s Ataulla Guerra clinically deposited the spot kick past opposing goalkeeper Terrence Lewis. The second big talking point came roughly ten minutes later, as swashbuckling Central utility player Jamal Jack lunged in on Williams in the Connection half. Jack, who operated in central midfield yesterday, was promptly shown his second yellow card although the combative Williams appeared to successfully evade the tackle. 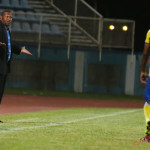 With the two big talking points aside, there was little for the healthy Ato Boldon crowd to shout about as both teams found it difficult to strike up any real rhythm for sustained periods in a game that featured hard, early pressing from both teams. 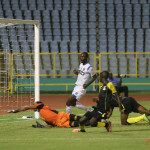 “It was a tactical game because it was two top of the table teams and both teams wanted to win the game,” Saunders said. Guerra and fellow midfielder Darren Mitchell were lively in the opening moments though. The former player nearly opened the scoring in the 15th minute, as he jinxed past his marker and fired a rasping left-footed shot that evaded Lewis and the crossbar. 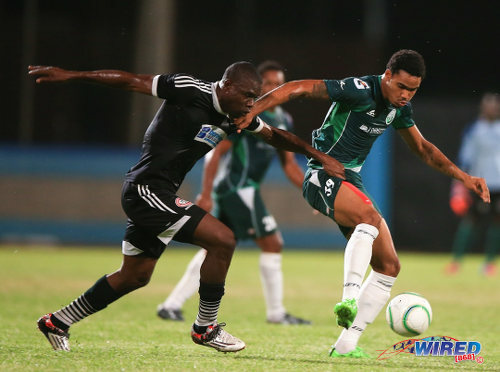 Photo: W Connection substitute Dwight Quintero (right) takes on Central FC defender Jamal Jack during the 2015 First Citizens Cup final. Joseph was then gifted a free crack at goal from long range just five minutes later, as Williams headed a Jan-Michael Williams clearance right into his path. However, the former 2009 World Youth Cup player was unable to make Gerard pay as, with Lewis six yards off his goal line, Lobo screwed his left-footed shot well wide of the goal. The deadlock was finally broken in the 38th minute as Quintero smartly guided a low, left side cross by defender Kurt Frederick past Jan-Michael and into the far corner. The former Central marksman had bitten the hands that once fed him, and it was not for the first time this season either. Quintero scored a pivotal regulation time equaliser in Connection’s Toyota Classic semi-final win over Central in November, en route to clinching that knock out title. The “Savonetta Boys” would have gone in to the interval 2-nil up, if not for a mammoth save from point-blank range by Jan-Michael in the 42nd minute. The “Soca Warriors” number one used every inch of his big frame to stop a Frederick strike, after the St Lucian defender linked up nicely with attacker Jomal Williams down the left. 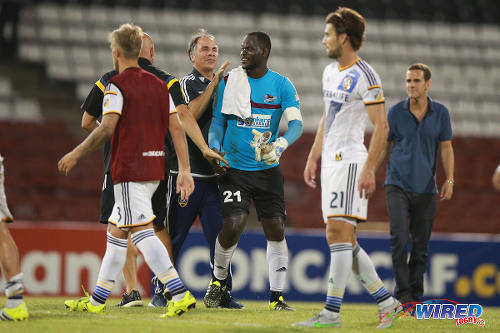 Photo: LA Galaxy coach Bruce Arena (centre) congratulates Central FC custodian Jan-Michael Williams, after their 1-1 2015 CONCACAF Champions League tie in August. Connection seemed to lack incisiveness up top without the threat of speedy attackers Neil Benjamin Jr and Shahdon Winchester. But their third attacking wheel, Jomal, nearly left his signature on the game in the 82nd minute. 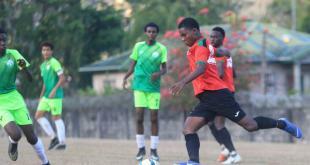 The tricky Jomal, who also goes by the soubriquet ‘Bebo’, nonchalantly dragged the ball past Central defender Akeem Benjamin at the edge of the area before bending a sweet, right-footed shot just over the angle of post and bar with his namesake, Jan-Michael, left without a prayer. It was nearly a spectacular end to an unspectacular contest. Central’s no-nonsense centre back Andre Ettienne also tried his luck at the audacious with an 89th minute free kick from half line, but Lewis preserved the stalemate as he back-pedalled to calmly catch the ball a few yards off his goal line. Saunders reflected on what could have been. 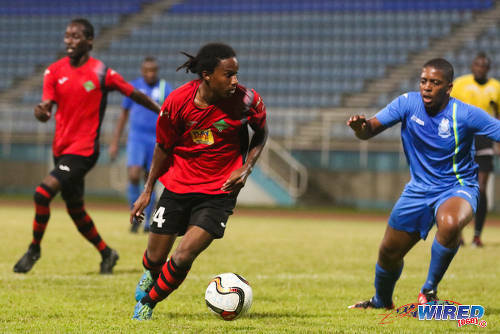 Elsewhere at the Larry Gomes Stadium, Morvant Caledonia United coach Jerry Moe may have whispered a philosophical word to Guyanese attacker Sheldon Holder, as the lanky forward notched a first half double to help pip St Ann’s Rangers 2-1. Caledonia’s third league win of the season sees them swapping spots with Rangers, who now sit at the bottom of the Pro League table with just nine points after 13 matches. W Connection (4-2-3-1): 1.Terrence Lewis (GK); 21.Shannon Gomez, 3.Gerard Williams, 5.Triston Hodge, 2.Kurt Frederick; 16.Alvin Jones (captain), 23.Kevon Goddard (8.Briel Thomas 60); 12.Dimitrie Apai (32.Isaiah Hudson 74), 14.Andre Toussaint (17.Aikim Andrews 60), 10.Jomal Williams; 19.Dwight Quintero. Unused Substitutes: 22.Aquelius Sylvester (GK), 4.Maurice Ford, 34.Jabari Mitchell, 46.Anfernee Frederick. Central FC (4-2-3-1): 21.Jan-Michael Williams (GK) (captain); 15.Kaydion Gabriel, 4.Andre Ettienne, 5.Akeem Benjamin, 24.Kevon Villaroel; 12.Jamal Jack, 25.Elijah Manners (7.Jason Marcano 50); 11.Darren Mitchell, 45.Ataulla Guerra, 9.Kadeem Corbin (19.Nathaniel Garcia 54); 99.Marcus Joseph. Unused Substitutes: 30.Akel Clarke (GK), 10.Marvin Oliver, 14.Nicholas Dillon, 22.Leston Paul, 26.Jem Gordon. 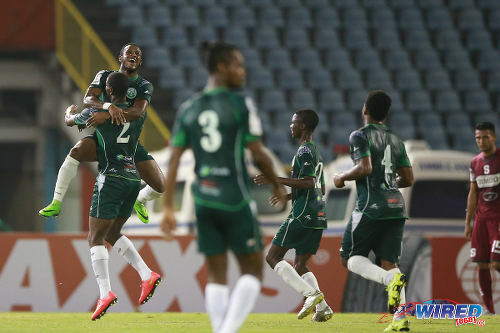 Photo: W Connection midfielder Jomal Williams (far left) jumps on top of teammate Kurt Frederick as they celebrate Frederick’s opening goal against Deportivo Saprissa in 2015 CONCACAF Champions League action. 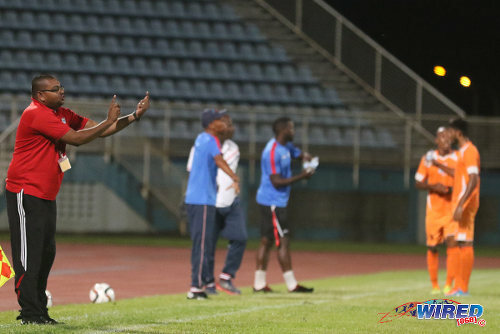 Photo: Morvant Caledonia United assistant coach Rajesh Latchoo (far left) gives instructions during 2015/16 Pro League clash with Club Sando last night at the Ato Boldon Stadium, Couva. 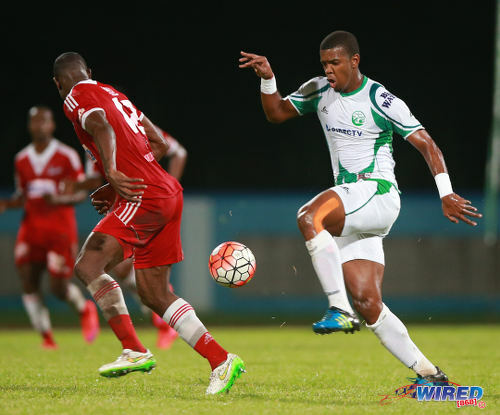 Photo: San Juan Jabloteh winger Sean Bonval (left) takes on Police FC defender Jasimar Ashers in 2015/16 Pro League action in Couva. 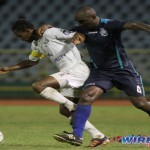 Central FC v San Juan Jabloteh, 8 pm, Ato Boldon Stadium. Hard match to watch as a spectator. Lacked fluency, and anything to talk about. Like the Central singers got a gig in Panorma ! Actually, apart from Jack’s yellows, I can only distinctly recall two other bookings. Only four? I should’ve kept count. Felt like about ten to me. Felt so to me. But we talking football so there is a minuscule to no chance I could be wrong… But there’s a first time for everything. Hahaha ? But it wasn’t a fun match to watch. Might have helped if the Central choir had showed up. Central like they missing Plaza yes. Any idea why da Silva didn’t play yesterday. Or why Oliver isn’t starting? Didn’t he start the season in the starting eleven? I feel like he started for the match against LA Galaxy. But I could be wrong. ?? Yeah they really are missing Plaza because he had the ability to carve out chances when nothing was on. I can only speculate that Oliver’s reduced playing time is down to the coach’s preference at this time. And yes Oliver did start against Galaxy. I hope Oliver not playing less because he’s still in the naughty corner for the littering incident.